Reed directed the 2008 film Yes Man, starring Jim Carrey. Yes Man is an adaptation of Danny Wallace's autobiography about his decision to say "yes" to whatever offer, invitation, challenge, or opportunity that is presented to him. Reed replaced Edgar Wright as the director of Ant-Man. Prior to joining the production of Ant-Man, Reed was slated to direct a Brian Epstein biopic, based on the graphic novel The Fifth Beatle. However, his commitment to the superhero film required him to part ways with The Fifth Beatle. Reed then went on to direct Ant-Man and the Wasp, the sequel to Ant-Man. Reed lives in the Los Angeles area with his wife Sheila and 2 sons. He was previously married to Beth LaMure from 1998 to 2006. ^ Stedman, Alex (7 June 2014). "Peyton Reed to Direct 'Ant-Man'". ^ McNary, Dave (December 4, 2013). "'The Fifth Beatle' Movie to Start Production in 2014". Variety. ^ Weintraub, Steve (July 17, 2015). "ANT-MAN Director Peyton Reed Talks First Cut, Deleted Scenes, Post-Credits Scenes". Collider. Complex Media. Archived from the original on July 17, 2015. Retrieved July 17, 2015. ^ "The Break-Up Director Peyton Reed to Helm The Fifth Beatle". December 4, 2013. ^ "Peyton Reed". Rotten Tomatoes. Retrieved April 26, 2015. ^ "Peyton Reed's Profile". Metacritic. Retrieved April 26, 2015. ^ "CinemaScore". CinemaScore. Retrieved April 28, 2015. ^ "Peyton Reed Movie Box office". Box Office Mojo. Amazon.com. Retrieved April 28, 2015. ^ "Surprise! The Break-Up beats X-Men". 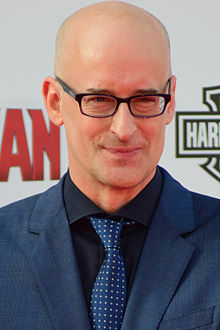 Wikimedia Commons has media related to Peyton Reed.